Heart rate variability (HRV) is a method for assessing the effects of stress on your body. It is a measurement of the time gap between your heartbeats that varies as you breathe in and out. Research increasingly shows that high HRV indicates good health and a high level of fitness, while decreased HRV is linked to stress, fatigue and even burnout. HRV is a holistic measure of total load, i.e. it reflects the impact of multiple sources of stress on the athlete, not just training, but sleep, nutrition, mental and emotional stress. The idea behind using HRV in training is quite simple: monitor your HRV every morning and train as normal. If your HRV drops significantly, take this as an early warning that you may be overloading the system. A small drop is normal as long as you recover because training is, after all, about stress and recovery. A hard session, especially on top of accumulated fatigue, will lower your HRV. HRV that remains out of an athlete’s normal range (both high as well as low) despite reduced training loads has been shown in research to be a sign of Non-Functional Overreaching. Join us in Manchester, UK for the 2018 Endurance Coaching Summit and learn more from experts like Simon. There are a number of apps available to measure HRV in athletes, but only a few have been independently validated for accuracy. Since HRV involves precise measurements on each heartbeat, the sensor used must also be validated as suitable for HRV. There are a few chest straps (e.g. Polar and Wahoo) and finger pulse sensors (e.g. ithlete) that have been shown to be sufficiently accurate. What was the new research? There have been a couple of studies that show incorporating HRV into your training plan may be significantly better than a standard program in terms of improving performance of club and recreational runners. Now, a new study by researchers from the University of Alicante in Spain and the University of Stellenbosch in South Africa have shown very promising results in road cyclists, too. Seventeen well-trained cyclists were recruited, with an average age of 39 years and riding experience of 13 years. Their average 40-minute time trial power (approximately their FTP) was 220 watts. As seen below, performance was measured three times over the period of the study: 1) at the beginning, 2) after 4 weeks of baseline training, and 3) after 8 weeks of guided training. For the last period, the group was split into HRV-guided and traditional (coach prescribed) training. HRV was measured by the cyclists at home every morning with a Polar H7 chest strap, and the heartbeat data was analyzed by the researchers using lab software. From this, a 7-day moving average of HRV was calculated. During the four baseline weeks, participants performed about eight hours of training per week, during which the mean and standard deviation of the HRV measurements were calculated for each cyclist. This produced thresholds for the HRV-guided training weeks that followed. During the actual 8-week training phase, an algorithm based on an earlier HRV-guided study with runners was used. The original daily guide was modified with tweaks to include HIIT, threshold days, and low-intensity training, and included rotations to avoid monotony. The practical outcome of this was a distribution of 66/24/10 percent in the three low/moderate/high intensity zones, respectively. For the group performing the standard plan, time spent in each zone was very similar to the HRV-guided group (64/27/9 percent), but with a fixed rotation that did not depend on the cyclist’s HRV for that day. Both groups spent an average of 9 hours training each week during this phase. The major finding of this new study was that HRV-guided training led to substantially greater increases in peak power (5 percent), power at VT2 (14 percent), and power over the 40-minute time trial (7 percent) compared to traditional training, where the peak and 40-minute time trial power hardly improved at all. The variation in HRV during the training phase was also much smaller in the HRV-guided group. How do I use this as a coach? 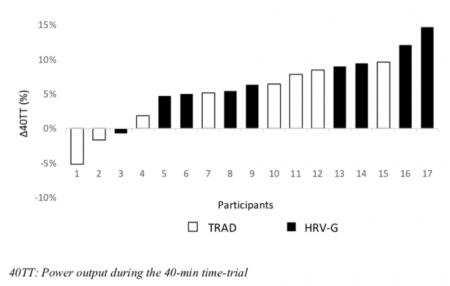 A key difference between this research and some earlier studies on HRV-guided training is that the weekly average is used, as opposed to the daily HRV score. This places a greater emphasis on accumulated fatigue over the short term, and is analogous to Acute Training Load (ATL). The difference between the two is the fact that internal load is being assessed rather than external load with ATL and Training Stress Score (TSS). At the start of a period of intensified training, the HRV 7-day average (often called the HRV baseline), is about 105 (20xLnRMSSD). Peak daily training loads were up to 270 TSS, and you can see the Acute: Chronic TL ratio headed up towards 1.6 on June 13. At the same time, the HRV 7-day average is declining, reaching 102 on that day. Daily TSS is reduced on June 14 and June 16, and then the HRV 7-day average start to rebound. On June 18 the average has reached a level higher than at the start, likely indicating that adaptation has produced performance gains. This is the principle used in the study’s algorithm. In very simple terms, pile on the load until the HRV 7-day average starts to decline, then back off either with rest or low-intensity sessions until the HRV 7-day average rebounds. The amount of training load required will depend on the athlete, and, in most cases, the dip will happen sooner and be sharper than that shown for the elite athlete in the example above. Watch out for dips in the 7-day moving average. There is not an automated version of this algorithm yet, but you could use a 1.5 point drop of 20xLnRMSSD (corresponding to a 7.5 percent drop in raw RMSSD) to trigger the switch from intense to low-intensity training. If you are using the ithlete app, watch for an amber “Weekly Change”. Athletes can watch for these changes, as well. For the spreadsheet-minded, you can calculate the standard deviation of the HRV 7-day average and take 0.5 SD as the smallest worthwhile change (SWC) and the threshold for switching. Have the athlete take at least four to five readings per week. Unlike driving each session from the daily HRV, the HRV 7-day average does not need a daily reading. Four to five readings every week are sufficient, but athletes should be encouraged to take an HRV reading after every training day. Encourage athletes to record subjective metrics and comments for context. These are very useful in making lifestyle changes that benefit the athlete’s health as well as performance. Avoid robotic monotony. Even if the athlete’s HRV 7-day average stays high, introduce some variation to reduce monotony. This approach is shown in the flowchart of the algorithm, where HIIT and moderate sessions were alternated each week. Don’t train hard when sick. Common sense should still prevail. 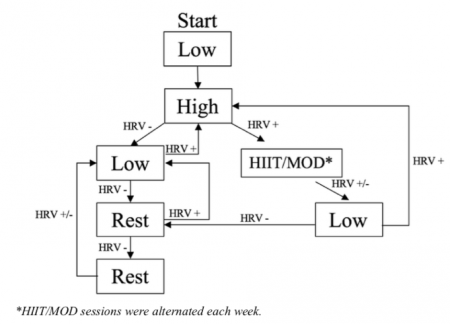 If the athlete is sick or has a large decline in daily HRV then rest is still the best option. Prescribing training based on HRV 7-day average produced better results in this study on well-trained endurance cyclists. Wider adoption will reveal whether this also applies to more recreational and elite-level athletes. The post New Study Widens HRV Evidence for More Athletes appeared first on TrainingPeaks. From the list of symptoms, one can easily see how jet lag can seriously hinder your athletic performance. Beyond the endurance and power needed in triathlon, the mental disturbances in concentration and fine motor skills cannot be overlooked. How can we minimize these problems and have the athletes training or competing at an optimal level as soon as possible after flight travel? Some simple steps taken before, during and after a flight to a new destination can help minimize any adverse effects of your travel. Ideally, jet lag planning starts well before the actual day of travel. A good way to prepare for your trip is to come into it well-rested and not already in sleep debt. This means getting eight to nine hours of sleep on a daily basis. Try to find the most convenient flight schedule, preferably a direct flight to the destination, or a minimum of layovers, especially if traveling at night. It helps to choose flights that arrive in the early evening at the destination so that you get a chance to sleep there. During the last 4 days before departure, try to get a jump start on your travels and adjust 2 hours towards local time at your destination. That means waking up ½ hour earlier per day in the mornings (if traveling eastward) or going to bed later at nights (if traveling westward). Eat and drink well before the flight. Bring your own food and water if you don’t like the airline foods and drinks. Set your watch to local destination time as soon as possible and synchronize your meal and sleeping patterns on the plane to local time. Drink plenty of fluids; mainly water, mineral or soda water, with occasional fruit juice if you have high energy needs. Don’t be afraid to ask for extra water on the plane. If starting the flight when local destination time is late night or early morning, try to get a short nap at the beginning of the flight. If flying during the daytime or evening at your destination, get up and move around as much as possible and include some light stretching. Use of compression socks and/or elevation of legs may prevent swelling. Airplane meals are not always ‘athlete friendly’. Bring your own snack foods to top off the meals provided if you have high energy needs. The goal is to adjust to the local sleep/wake patterns as soon as possible after arrival. A short sleep before noon may be OK if arriving in the early morning after an eastward flight. But try to avoid extra naps during the daytime! Prolonged daytime napping (more than 1 hour) in the new location should be avoided for a few days, as this may act to keep you with your old rhythms. A carbohydrate-rich meal is recommended 1-3 h before going to bed the first day. Be prepared to have a few days of low training intensity. Use this time to find your way around the venue. Overall, the most important indicator of whether you’ve succeeded in adjusting your body to the destination time zone is, of course, how you feel. Take note of how your next trip and competition go so you can assess what worked well and what can be improved. Also, remember these tips for time adjustments are just as important when going back home as they are when arriving to an event! The post Tips for Athletes Traveling Across Time Zones appeared first on TrainingPeaks. In the summer of 2013, Ryan Cooper took a few weeks off of work to answer a question: could you accurately predict a cyclist’s performance using a fast, easy-to-use model? Over five years later, Ryan is the co-founder and chief scientist at Best Bike Split, a tool that helps cyclists of all levels develop optimal pacing and training strategies using proven technology. The post TrainingPeaks Coach Cast: Ryan Cooper appeared first on TrainingPeaks. As part of my role as Education manager here at TrainingPeaks, I travel all over the world teaching athletes and coaches how to get the most out of their TrainingPeaks accounts. 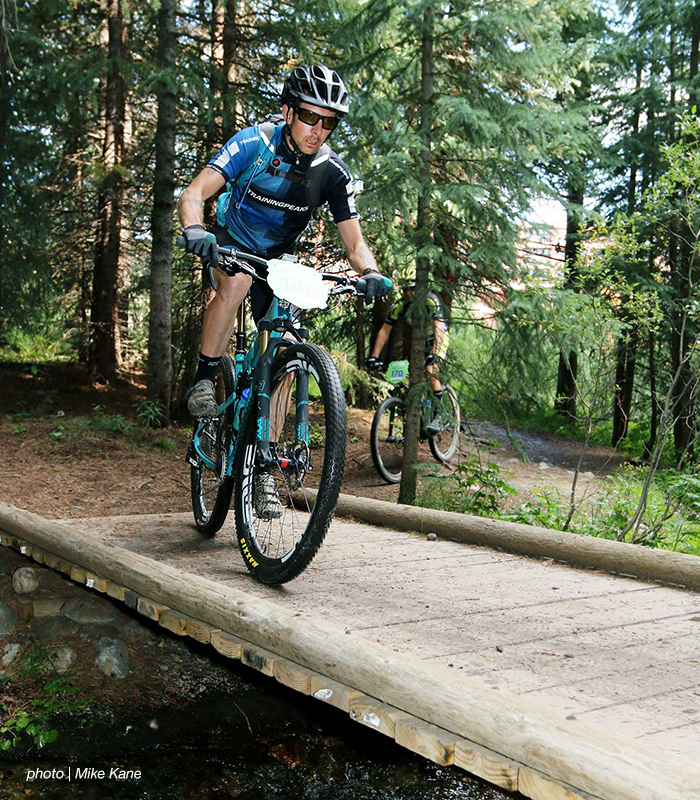 As you can imagine, this hectic work travel schedule is not conducive to training, especially when your ‘A’ race is the Breck Epic, a 6-day mountain bike stage race with 40,000 feet of climbing! I have typically planned my own workouts each season, but this year I decided work with a coach: Nate Wilson of Catalyst Coaching. I wanted to be pushed outside my comfort zone, get an objective opinion, and take workout planning off my to-do list. Here are few key elements Nate and I focused on to get the most effective training on my limited schedule. During the cold, dark days of the winter, we went for quality over quantity by leveraging the power of the trainer. I did 2-3 quality sessions during the week, with intervals aimed at raising my FTP. On weekends when I had more time, I did one or two more endurance sessions. For the quality sessions, we used the TrainingPeaks workout builder to eliminate any room for confusion or uncertainty. By transferring the workouts to my Garmin, I knew exactly how long my work and recovery intervals were, and my precise power targets. For the longer rides we broke up the monotony by using a smart trainer and dropping into a virtual group ride, which made the time fly by. These trainer sessions were much more fun than aimlessly slogging along at a constant wattage! When light is limited and temperatures are low, there is not a lot of point in trying to emulate a classical periodization model where January and February might mean long aerobic base miles. For someone with six hours available to ride each week, they just end up with pretty slow progress. Rather than getting hung up on specifics, I focused on trying to build Dave’s general fitness as much as possible—which meant more intensity to get more bang for our buck. This also helped keep workouts varied and fun, so that even though intensity was high, he arrived to the summer mentally fresh and ready to keep working hard. Long rides don’t have to be “just riding” for the sake of it. There is nothing wrong with dropping some intervals in, or a virtual group ride to break the time up. A lot of speed can be gained by improved technique, whether it be pedal stroke efficiency, the ability to comfortably ride out of the saddle, or riding at varied cadences. A 2.5-3 hour “base” ride on the trainer is the perfect time to incorporate some technique work which, when riding outside, might get forgotten. Once it started to warm up we still utilized the turbo trainer quite a bit for the efficiency (not having to find an optimal stretch of road to start my intervals saved a ton of time. I could wake up early, knock out a quality workout, and be in the office having started my day off on a positive note. Then, on the weekends we took it to the trails for some specificity. As great as the trainer is, there is just no replicating the beating your body takes from a rocky trail! Having done so much quality work on the trainer before summer hit, we didn’t have to worry about combining technical skill work with structured workouts once the trails dried out. We were confident that we’d brought Dave’s fitness to a good place, and that the most important thing to do next was to build up the technical specificity that Breck Epic requires. In a lot of ways we were getting more task-specific as we approached our target event—but that didn’t occur via super-specific workouts. It came much more in just spending time on trail, and on as many different trails as possible. I see mountain bike athletes all the time who have their “home trail, and they just get really good at riding that. While having a trail system you know well and can ride fast is a great resource, It’s also important to be able to show up at a race and know how to “read the trail”. Since it was unrealistic for Dave to get comfortable on the 250 combined miles of the Breck Epic, the next best thing was to spend a lot of time on unknown trail and get him comfortable with the unfamiliar. I travel for work fairly often, which can make riding really tough. I’ve never been a fan of hotel gym bikes, and even if I’d brought my own bike to ride outside, it can be really stressful to find new routes and anticipate international driving laws. So on travel stretches (of 1-2 weeks at a time) I just busted out the running shoes. It was nice to take a break from a bike and there really is no better way to explore a city than on foot. In addition, running can help to address some of the deficiencies and imbalances that tend to develop over time if all you do is ride. Due to the frequency of my work travel, and the unpredictability of changing seasons, it was difficult to string together a lot of uninterrupted training time. So, we worked with what we had available and planned to overreach a bit when we knew a trip was on the horizon. With this strategy we would go into a “hole,” knowing that while I was away I would have a lot of time to recover. Mind you however, sitting on a plane for 18 hours is not ideal recovery. Rather than stressing about missed time on the bike, or trying to mimic workouts on a hotel bike (and perhaps coming home with tendonitis from going all-out on a bike that doesn’t fit), we were able to get some recovery and mental freshness during the travel periods. Running was great training, but also allowed Dave to come home and have really focused periods on the bike. He may have taken some more time off the bike than folks without a travel schedule, but it also allowed him to work harder and stay more focused during his “on the bike” periods. Luckily the last two months before my a race did not contain any travel and allowed us to really buckle down and put the finishing touches on my preparation. With the nicer weather and more time available time we upped the volume a bit by adding commutes to and from work when the weather allowed. I also logged some substantial trail time, and added some specificity with a few lower-priority fun races. When the Breck Epic rolled around, it went well. I felt prepared and like I was riding stronger than last year. A shortened first stage due to weather meant I had the energy to really push it on the later stages, and I managed a 3rd place on stage 5, which moved me up into top 10 in the GC. I had some early setbacks due to mechanicals, but that turned out to be a blessing in disguise, as it provided some unplanned recovery and forced me to pace the earlier stages more conservatively. Time comes at a premium for most busy adults balancing a life, family, and training. But by enlisting the help of a qualified expert you can make the most of your limited training time and still enjoy the rush of accomplishing your goal! The post TrainingPeaks After Hours: Dave’s Breck Epic Prep appeared first on TrainingPeaks. You coach endurance athletes. Goal-oriented, disciplined, and driven are some of the words people will use to describe them. Endurance sport performance selects for those who have demonstrated these values. The start of a marathon or a triathlon is lined with better-trained individuals than, say, the bench of an adult kickball game. In the latter, you can reasonably expect to show up with a 6-pack of beer on a Tuesday night and still be the game’s MVP. As a coach, you probably advise a different pre-race nutrition strategy. Successful training is a product of stress and rest repeated over time. Discipline is required to achieve this consistency, but let’s remember the higher goal is consistency. Discipline is a way to achieve consistency, but so is fun. Prescribing training with no fun is like cooking food with no flavor. You might be able to get the meal down, but will you want it again and again? Your athletes are not machines. As much as we might like to convince ourselves that we can tick off a certain wattage on the bike or pace on runs “automatically,” we’re still human beings. There are thoughts and emotions which contribute—positively or negatively—to performance. Encourage your athletes to structure their training environments to cue emotions and thoughts which lead to improved performance. It’s well-documented that emotions contribute to athletic performance. Music can act as a trigger for those beneficial emotions and as distraction from the discomfort of the moment. A 2015 British study found that listening to music with “emotional resonance” for the test subject improved endurance performance up to 10 percent. Emotions are strong when we are weak. You can help coach your athletes to find the right playlist through encouraging them to learn self-awareness. Do they perform best when angry, happy, relaxed, or threatened? Why not cue the emotions that help with the task at hand, and then let the emotions do the work? Helping your athletes find their optimal emotional state for performance differs individually, so play with music selections to see what works best. Also, this goes without saying, but you cannot have consistent training without prioritizing safety so no headphones on the roads! Try a bluetooth speaker in your back pocket instead. There’s an anxiety to beginnings. It’s not uncommon to dread or procrastinate a key workout as fatigue and outside stress build. Unproductive thoughts can quickly spiral out-of-control. It’s your job to remind your athletes that beginning the session gets them closer to the end. Encourage them to plan something enticing following the workout and link the workout to other activities that get them excited. Get them out the door! It’s tempting to think of rewards as “big things” we only gift ourselves once in a while. Remind your athletes of the countless smaller rewards accompanying their athletic journey, and encourage them to imagine that addictive post-workout high. Linking workouts to one other positive thing will get your athletes moving. The first step, pedal, or stroke is the hardest then momentum becomes their friend. Individual reality is a product of one’s thoughts. For an athlete who needs to run in the morning, encourage them to run somewhere with a beautiful sunrise. You’ll be prescribing a sunrise to be enjoyed while running instead of the usual “AM Run.” There are countless strategies like this to build rewards into the regular plan. Be creative! We organized a group that consistently met at the taco shop at a set time, and almost immediately the final workout of the day went from being something I dreaded to something I did before downing horchatas and endless bowls of salted tortilla chips. Instead of thinking about how heavy my legs felt, I instead thought of Matt and Jen waiting at the trailhead. We’d scheduled a reward for after the run, but the larger reward was the company on the trail. Help your athletes find some friends or locate a group, and then build it into their weekly schedules. Including friends and training partners can make an athlete’s training plan feel like a normal part his/her life instead of a demanding distraction. When motivation is low and it’s hard for you athletes to do much of anything, be like a doctor and change the prescription. As a coach, it can be easy to fall into a routine based on your experience that turns into monotony for your athletes, but there are endless mental strategies you can use to transform your training plans. If you normally schedule runs based on time, switch to a mileage goal instead. If you normally calculate pace in miles/hour or minutes/mile, switch to the metric system for a week. Help your athlete find a different pool or track. Help them find open water and prescribe 15×80 strokes at whatever feels like threshold instead the 15×100 threshold set they’ve been repeating for the past six weeks. Challenge them with Strava segments, to join a race on Zwift, or to build a mental game based on town welcome signs or dashed vs. double yellow lines on the road. Shift their perspective and their training grounds will be transformed into a playground. Contrary to popular belief, focusing on the “fun” as an important part of training is a strategy that makes preparation both more effective and more sustainable. Endurance competitors require flexible thinking as athletes adjust to inevitable ebbs and flows of motivation. Tapping into some of these natural strategies to keep athletes entertained, and thus engaged, while their body trains and races will help them feel better about their routine, train more consistently, and dull their perceived exertion during sessions. Use the points above as a starting point, and use your creativity to expand from there. The post Smiles and Miles: 4 Strategies to Prescribe Training That is More Fun appeared first on TrainingPeaks.